Vice President Mike Pence cast an historic deciding vote Tuesday to confirm Betsy DeVos as the next secretary of the U.S. Department of Education. Pence’s vote was in accordance with his post as president of the Senate. The Senate vote was 50-50, with two Republicans, Sens. Susan Collins (ME) and Lisa Murkowski (AK), voting against DeVos. “The Senate being equally divided, the vice president votes in the affirmative, and the nomination is confirmed,” Pence said in the Senate. DeVos has been one of the most controversial picks for President Donald Trump’s cabinet. Objections to her nomination have come from both the left, including teachers’ unions, and the grassroots base of the GOP who want to see the federal education department dismantled and oversight of education turned back to parents and local school districts. Democrats, like ranking member of the Senate education committee Sen. Patty Murray (WA), highlighted DeVos’ vast wealth and potential financial entanglements, as well as a lack of experience with the public school system. 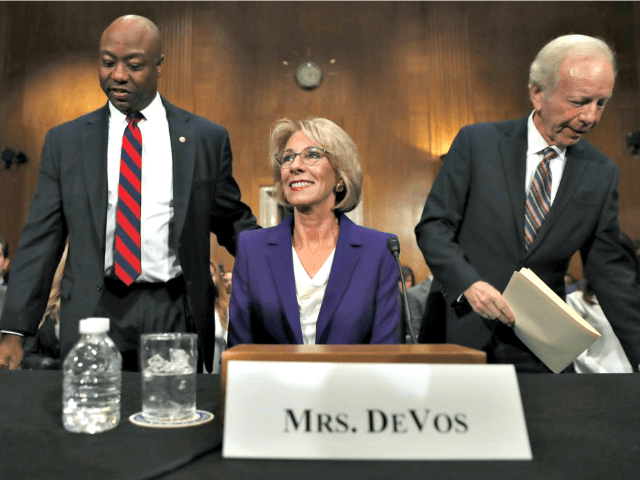 Republicans, such as Sen. Tim Scott (SC), however, said DeVos’ work in the area of school choice, to help children in low-income school districts escape failing public schools, makes her qualified to lead an education system that is abandoning may of its students.